The practice of relying upon a Spiritual Guide, or ‘Guru Yoga’, is the root of the spiritual path and the foundation of all spiritual attainments. In Kadampa Buddhism, Guru Yoga is practiced in association with Je Tsongkhapa, an emanation of the Wisdom Buddha Manjushri. 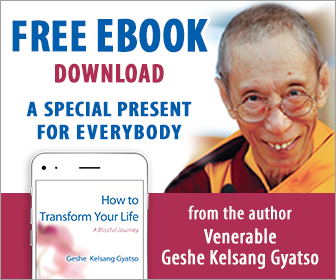 The principal Guru Yoga of Je Tsongkhapa is Offering to the Spiritual Guide, which is an extensive practice that is usually performed twice a month, on the 10th and 25th days, at Kadampa Buddhist centers. It was compiled by the first Panchen Lama, Losang Chökyi Gyaltsän, as a preliminary practice for Vajrayana Mahamudra. Although the main practice is reliance upon the Spiritual Guide, it also includes all the essential practices of the stages of the path (Lamrim) and training the mind (Lojong), as well as both the generation stage and completion stage of Highest Yoga Tantra. Guru yoga is a special method for receiving the blessings of our Spiritual Guide. Here, the term ‘Guru’ does not imply that our Spiritual Guide should be Indian. Our Spiritual Guide is any spiritual Teacher who sincerely leads us into spiritual paths by giving correct instructions. 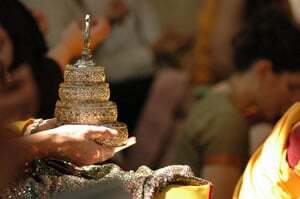 Thus our Spiritual Guide can be oriental or western, lay or ordained, male or female. These days, for example, it is quite possible to meet a Spiritual Guide who is a western lay female. The term ‘yoga’ in this context indicates a special way of viewing our Spiritual Guide. To find out more about this practice, see the book Great Treasury of Merit.